We’re about to give you a bit of legal advice. 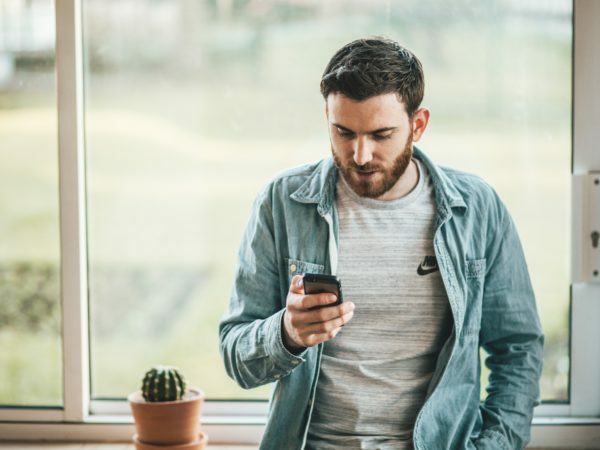 Not the kind that will help you in court by any means but it could help you bring in that next client and its information that can help your firm appear towards the top of search results in your area when people are looking for help. We’ve worked with several law firms over the years, and the number one issue they encounter is driving search rank so that they appear towards the top of the list when people are searching for a particular practice specialty. Many factors can weigh into how high up you can reach. Client reviews on Google and Facebook, optimized content targeting specific keywords, but one of the most significant signals is the reputation of your business as measured by the number of sites that are linking to your website. Developing a link building strategy isn’t as easy as it seems. You need to avoid link farms and black hat tricks that could land you in a penalty box with Google. You also want to make sure that your efforts are put in the right place. Earning links that hold value and authority, not just driving links in sheer volume. One of our search tool providers recently conducted research analyzing backlink profiles for leading legal services firms across the country. 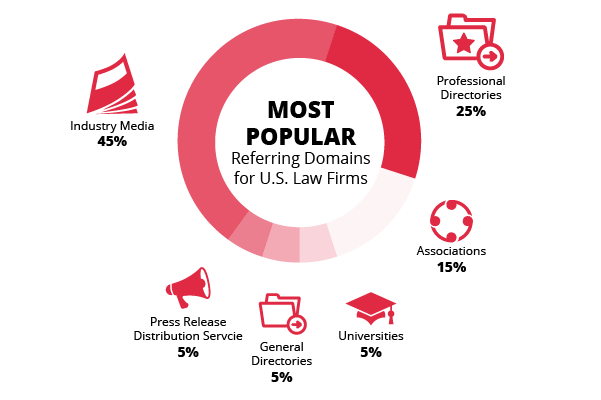 The results of that study helped to reveal the most popular and the most reputable domains that link back to the top law firm websites that were analyzed, over 2,000 of them and reviewed over 60,000 referring domains that were linking to those firms. The methodology included a look at the referring domains that linked back to over 50% of the law firms analyzed. Then they identified which domains were the most reputable and which were the most popular. Some of the primary takeaways from reputable domains showed that credible news outlets and universities appeared to be the main sources of backlinks impacting legal services firm websites. Each of these sources accounted for 40% of all the domains from the top of the list. They are followed by smaller impact, but still relevant sources including industry media, local directories, professional directories, and press release distribution services each of these categories accounting for 5% of all the backlink domains. An interesting finding that we are discovering to be quite beneficial is the impact of backlinks placed on university websites relating to lists of alumni that include their current job positions and their company news. The high percentage of universities sitting among the most reputable linking domains show that leading legal professionals are closely tied to their alma mater alumni communities. 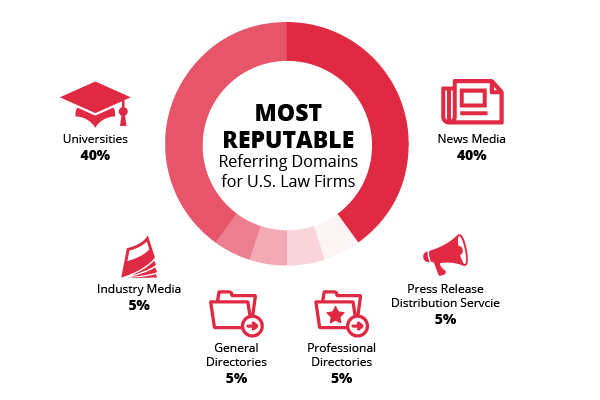 Over 60% of the leading legal firm websites have strong backlinks from each of the most reputable domains, which is no surprise in the coverage and attention that leading law firms can command. Basically, if your rivals have backlinks from these domains, you should try to acquire a link from these resources as well to keep up with the competition. The popularity of backlinks is a very different animal from reputable domain sources. These are often sites that are easier to acquire a backlink. They consist mainly of industry media, professional directories, and professional associations. The link building tactic is a popular one among law firms with 80-99% of the leading firms utilizing the tactic and acquiring significant volumes of backlinks to their websites from these prominent domains. In this industry, you can’t just sit by – you have to compete. These popular domains have lower authority scores and less traffic overall and certainly don’t compete with the value of the domains referenced in the reputable column. But they are often easy wins that when placed in volume can really add up and help boost your overall rank. The traffic derived from these industry-specific links is highly targeted and high value concerning PR and brand awareness within the particular nice of law firms. They can help you position yourself as an industry specialist, and it’s crucial to be mentioned on these web resources that are closely related to your business. Although building up backlinks from these sites can be a good source of highly targeted traffic, not all backlinks are created equal. This is where a well thought out strategy comes into play. Proper research and planning can help determine which backlinks to acquire and what the priority order might be. This is where engaging with a reputable and experienced digital agency can really help. Your focus and energy needs to stay on clients and spending hours combing through opportunities, measuring the effectiveness of opportunities and then doing the outreach will take a lot of work. And even more work if you haven’t done this before. If you are interested in a complimentary assessment to see what some of the opportunities are for your law firm’s website, please reach out! We’d love to chat.